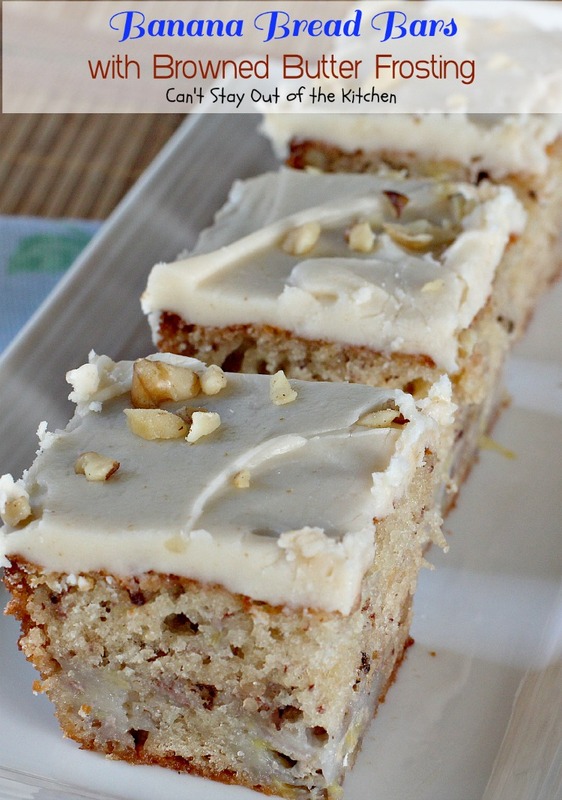 Banana Bread Bars with Browned Butter Frosting are amazing. Okay, I have to admit I love frosting–on cookies, cakes, brownies–anything. 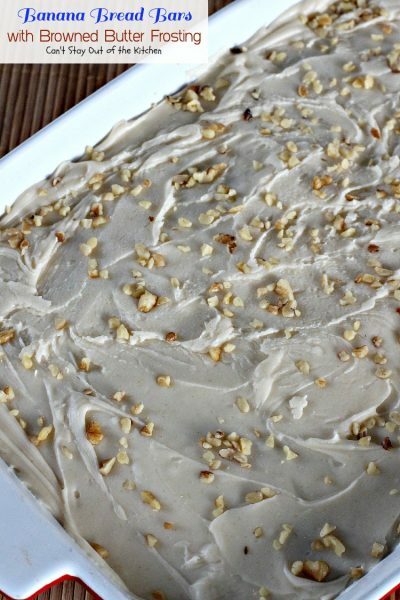 But Browned Butter Frosting is in a league all of it’s own. 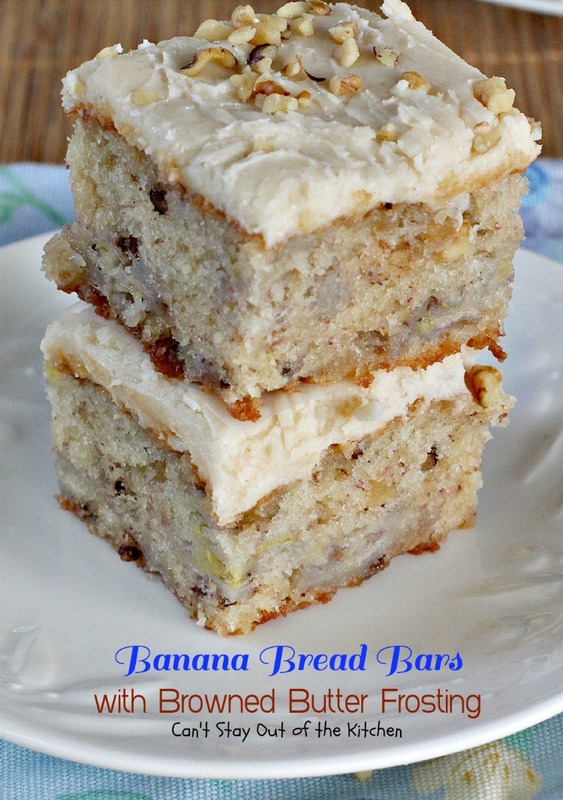 And these Banana Bread Bars with Browned Butter Frosting are amazing. 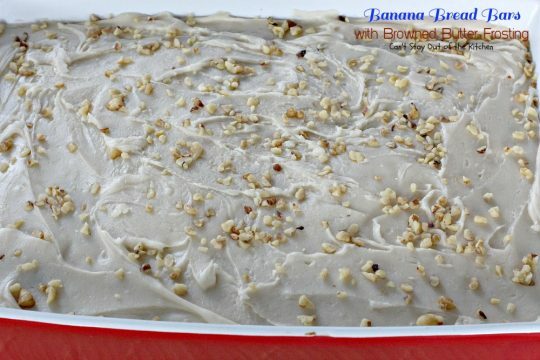 The Banana Bread Bars are filled with bananas and walnuts, and after browning the butter and making the frosting I sprinkled more walnuts on top for additional flavor and texture. They turned out heavenly. 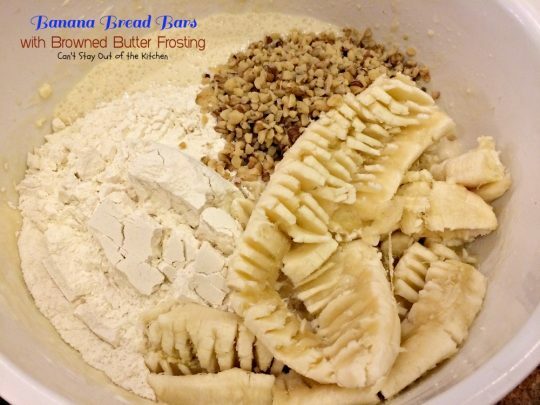 On top of that it’s a great way to use overripe bananas. Banana Bread Bars with Browned Butter Frosting are so scrumptious you may find them addictive! 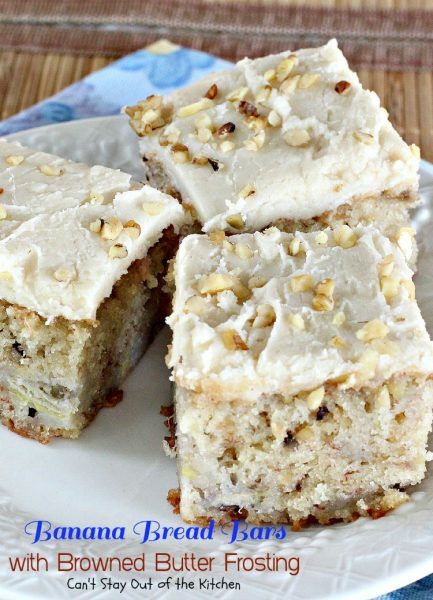 Having chopped walnuts in the batter as well as the icing adds such great texture to these bars. 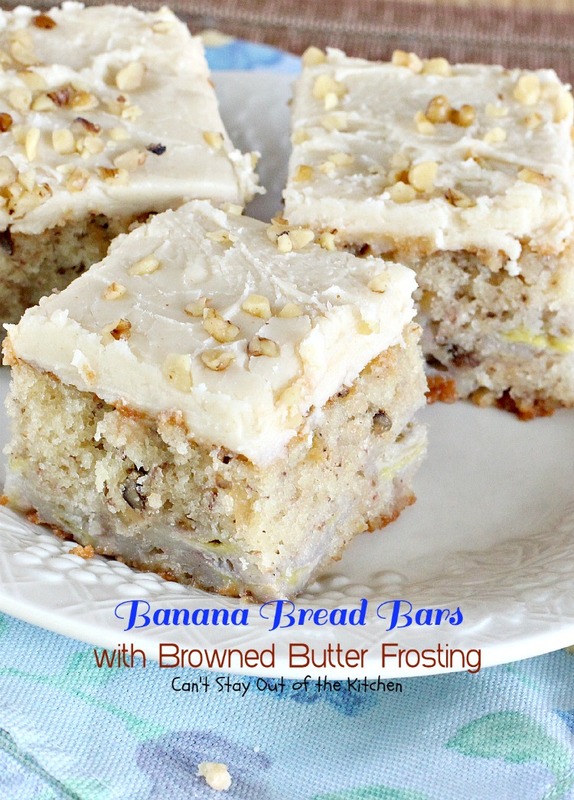 Try Banana Bread Bars with Browned Butter Frosting for your next holiday potluck or gathering. I used these ingredients for the bars. 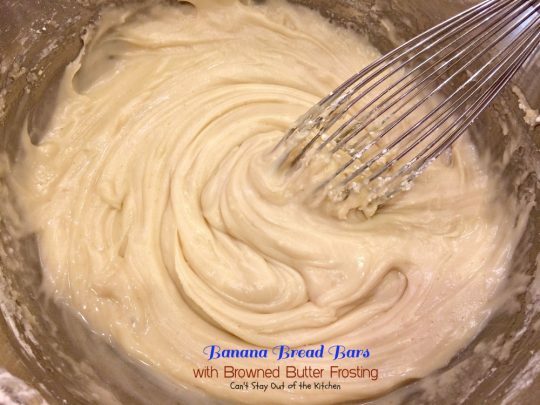 Mix butter, sugar, eggs, salt, baking soda, vanilla and sour cream (or Greek yogurt) with an electric mixer until smooth. Add UNBLEACHED all-purpose flour. 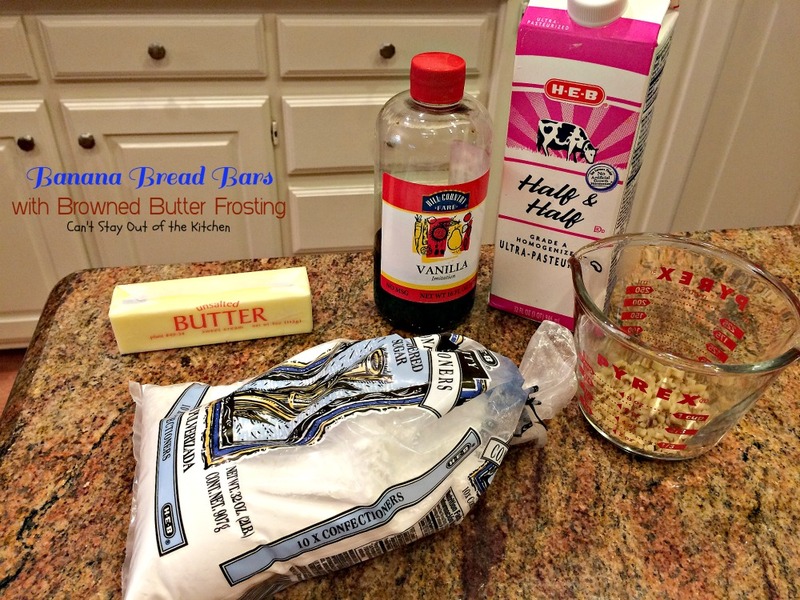 Bleached flour toughens baked goods. Add bananas and walnuts. 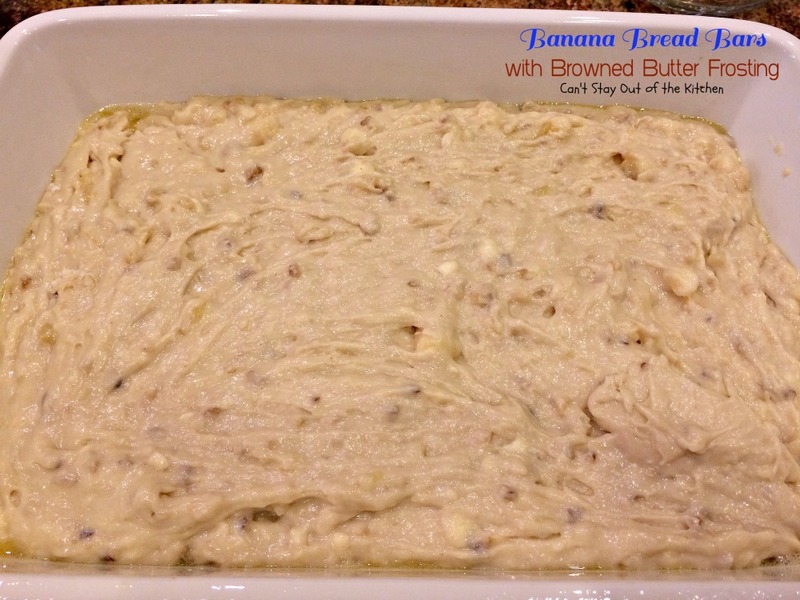 Spoon batter into a greased 9×13″ baking dish. Bake at 350 for 45 minutes or until a toothpick inserted in center comes out clean. Cool completely. 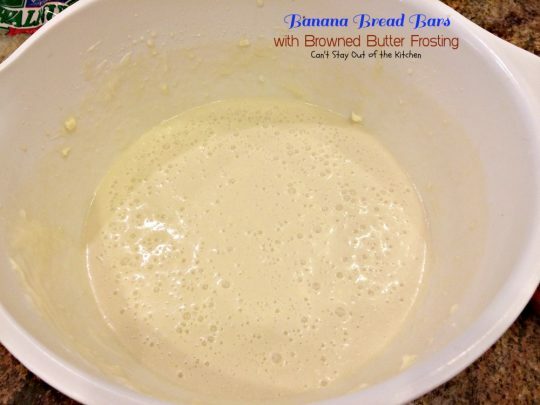 Place butter in a saucepan and bring to boiling and slightly browned. Remove from heat. Add vanilla, half-and-half and powdered sugar and whisk to combine. Spread frosting over cooled bars. Sprinkle with nuts. Cut into bars. 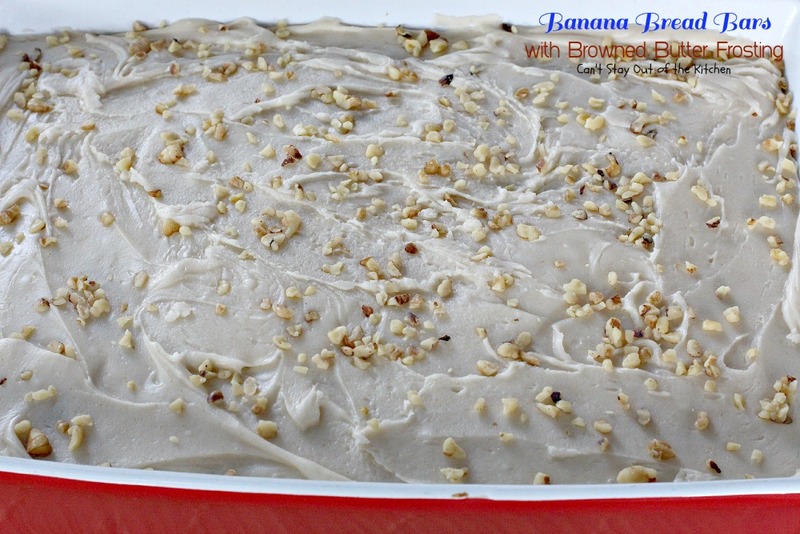 Banana Bread Bars with Browned Butter Frosting make great bars for tailgating parties. These dessert bars are also great for any summer backyard barbecue. These lovely dessert bars are topped with a fantastic Browned Butter Frosting that's absolutely heavenly. Great way to use up overripe bananas too. 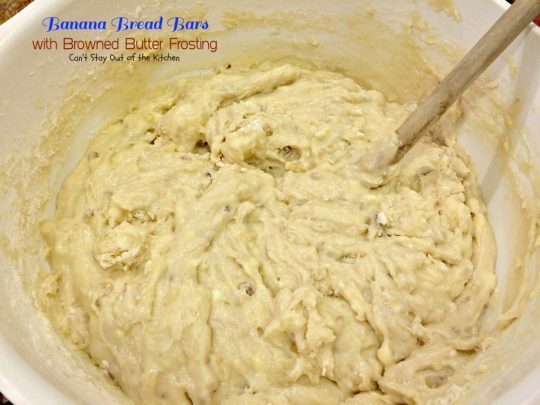 Mix sugar, butter, sour cream (Greek yogurt), eggs, vanilla, salt and baking soda with an electric mixer until smooth and well mixed. 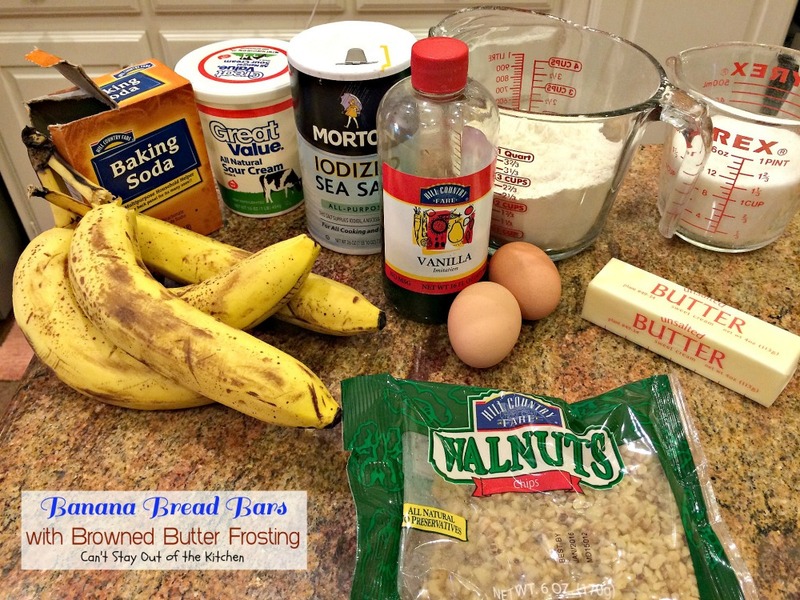 Add flour, bananas and walnuts. 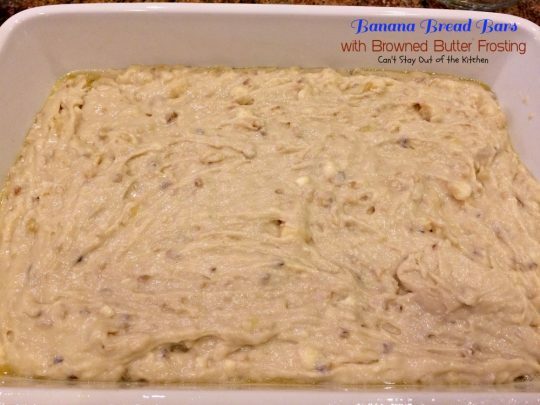 Spread banana bread mixture into prepared dish. Bake at 350° for about 45 minutes or until a toothpick inserted in center comes out clean. Cool about 10 minutes before frosting with icing. Heat the butter until boiling and slightly browned. Add vanilla, powdered sugar and half-and-half and stir well to combine and mixture is smooth. Spread over top of warm Banana Bread Bars. Sprinkle finely diced walnuts over top for garnish, if desired. Pat the walnuts down into the icing very gently. 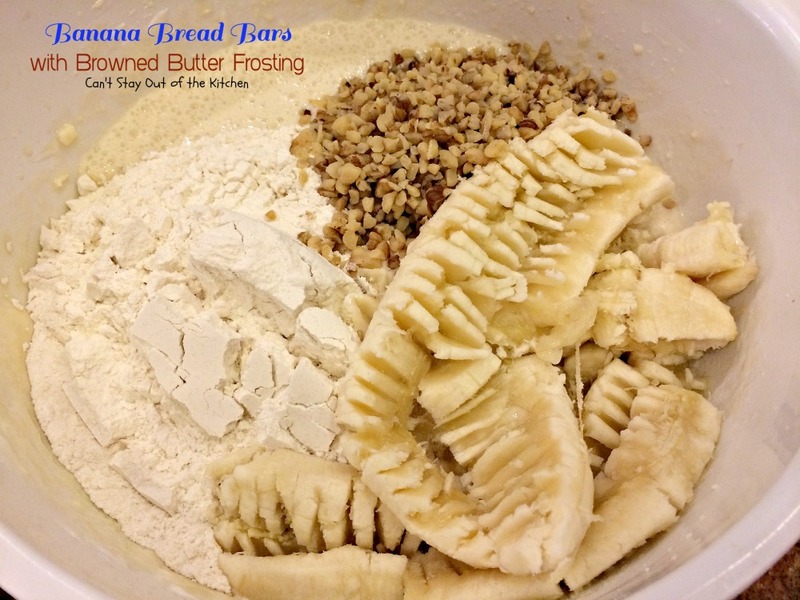 Allow mixture to cool completely before cutting into bars. Recipe adapted from My Life of Travels and Adventures. 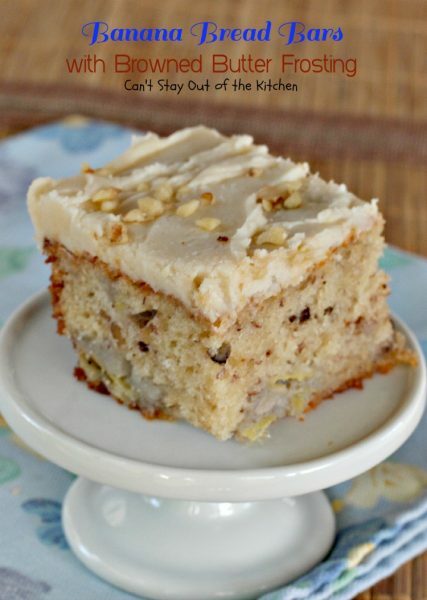 These lovely dessert bars are topped with a fantastic Browned Butter Frosting that’s absolutely heavenly. 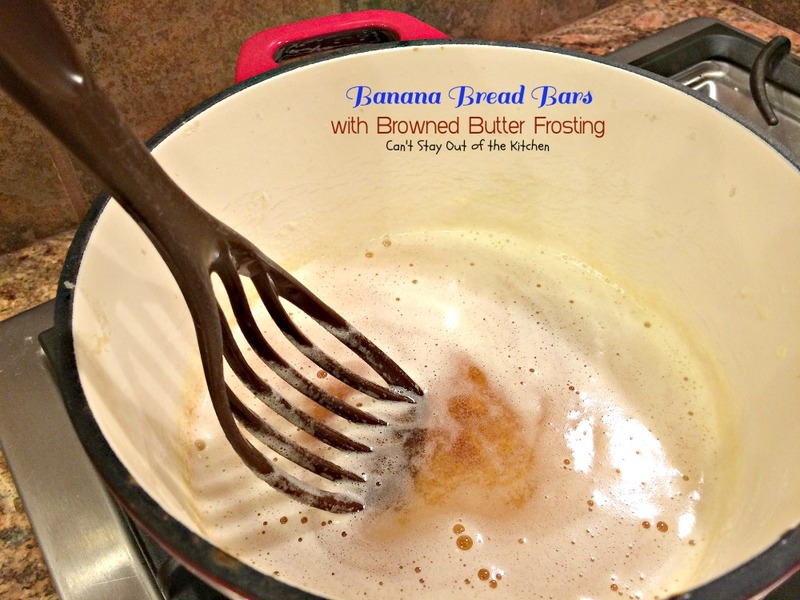 Great way to use up overripe bananas too. I loved the taste of these delectable bars. 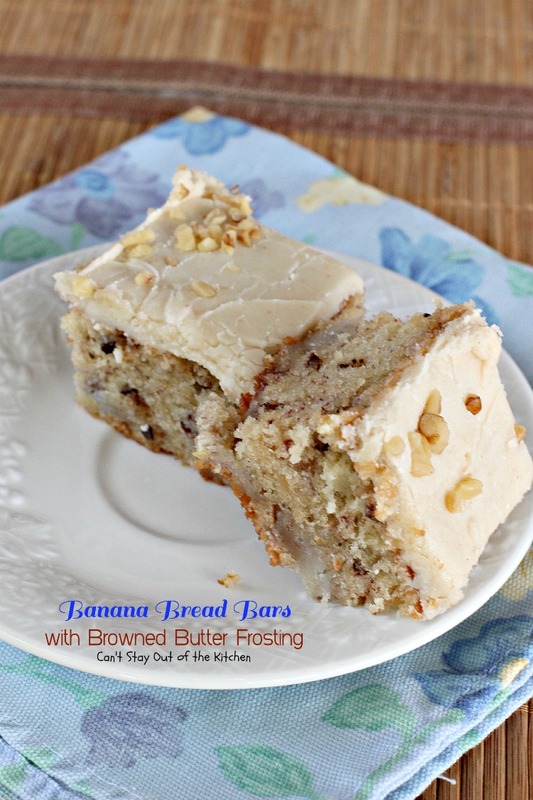 Place Banana Bread Bars with Browned Butter Frosting on your next summer menu! Absolutely amazing!! Do you know if you can freeze them? Hi, Barb. Yes, I actually did freeze these bars for a couple of months. I put them in plastic containers with waxed paper between stacked layers. Have made the Banana Bars several times and took to Church. They raved about them. Hi, Margaret. So glad you and your friends at church have enjoyed these cookies. They really are terrific. Thanks for stopping by and letting me know. These are our new all time favorite! The frosting makes these bars! The sweet/salty flavor was fabulous! Thank you for sharing!! Thanks, Cathy, I really appreciate you stopping by and letting me know. I thought they turned out terrific too. Have a great weekend. These banana bars are outstanding!! Thank you. Just came across these babies on Pinterest – and I am in love! Thank you for sharing! They are so good, I hope you give them a try soon! 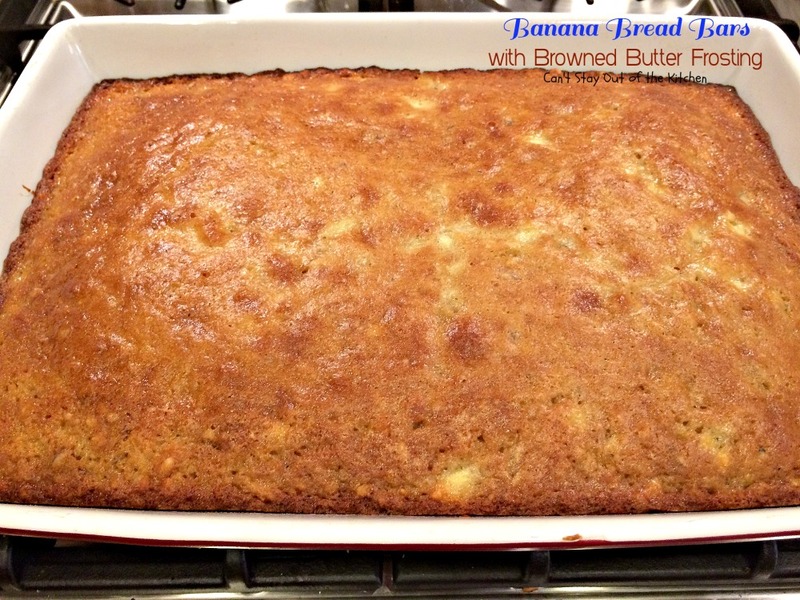 these by far are the best banana bars I have ever made! Will be making these again. I did the same with the walnuts since my husband and I both love any kind of nuts.